On Saturday, I embarked on a new (to me) racing distance: the trail 30K. Not quite as familiar as the trail halves Jesse and I like to regularly run for fun and not as gut-wrenching as a marathon, I decided this distance was the perfect last training push before the North Face Endurance Challenge 50K in three weeks. I was really excited – and a little nervous – to run the Inside Trail Mt. Tam Trail Run 30K. Although I’ve ran all of these trails before, stringing them together to forge a difficult course with 4,600 feet of elevation gain was both daunting and necessary before TNFEC. I used this race as a way to test out my new backpack, fuel plan, and pacing strategy for the 50K. Beginning at Stinson Beach, I knew I was in a better position than last time I traversed the Dipsea. 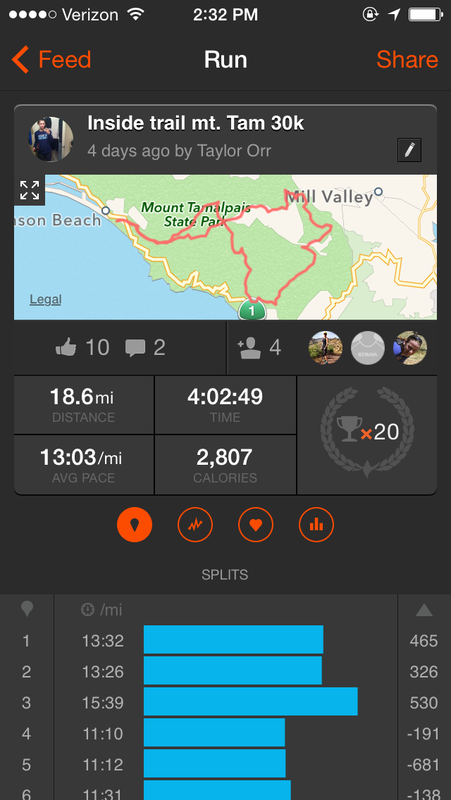 In 2012, I ran the Double Dipsea two weeks after my first marathon, and it wasn’t pretty. I completely bonked by the time I reached the stairs in Mill Valley and had a terrible time during race. This time, I ran much more of the uphill and continued moving at a decent clip while traversing Steep Ravine. I had never experienced this section of trail before, and the Hobbit-esque scenery was beautiful. After quickly grabbing a few cups of water, a couple potato wedges dipped in salt, and a handful of Clif bloks, I hit the much welcomed downhill at Ben Johnson. Energized by my fuel, I started getting excited and running faster, but I slowed down realizing I had almost a half marathon left. After we broke off from the 50K runners in Muir Woods, I started feeling a little gassed and low on fuel, so I mostly walked up the lost trail and ate and drank as much as I could. Running the Redwood and Sun trails was my favorite portion of the race. Jesse and I run on these gradual trails regularly, and the mostly flat section was a welcome break from hoofing it uphill and the jarring downhill. At the second (of three) aid stations at the Redwood Creek Trail, I started to get a wild hair and after this point, no one passed me. I made the same speedy stop I had at the first aid station, and ran through the flat portion until the switchbacks at Heather Cutoff. As much as I dislike the run/walk up Heather Cutoff, I made good ground and ran about half of the uphill. 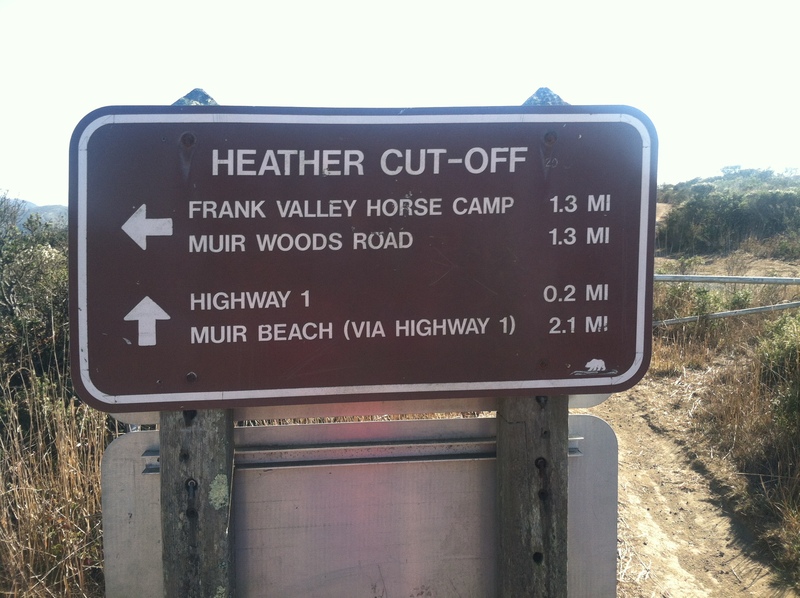 After I made it up Heather Cutoff, I realized that what I dislike even more than Heather Cutoff is the unrelenting uphill that is Coast View Trail. I continued to run/walk, picking people off who started walking this grueling section of the race. I didn’t take any photos during the race, but this one is from the Redwood Creek Trail. The entire time I ran/walked up Coast View Trail could see the end of the elevation at Cardiac, and I knew that once I made it to Cardiac, the rest of the race would be almost literally downhill from there. I skipped the aid at Cardiac in lieu of running down the hill as fast as I could. As I made my way down Dipsea toward Stinson, my right contact decided to pop off my eye during a particularly dark and slippery portion of the trail. With only about two miles left to go, I felt like I was going to start crying from feeling so disheartened. I have terrible eyesight, and losing good vision and my depth perception during a treacherous portion of the Dipsea was downright scary. 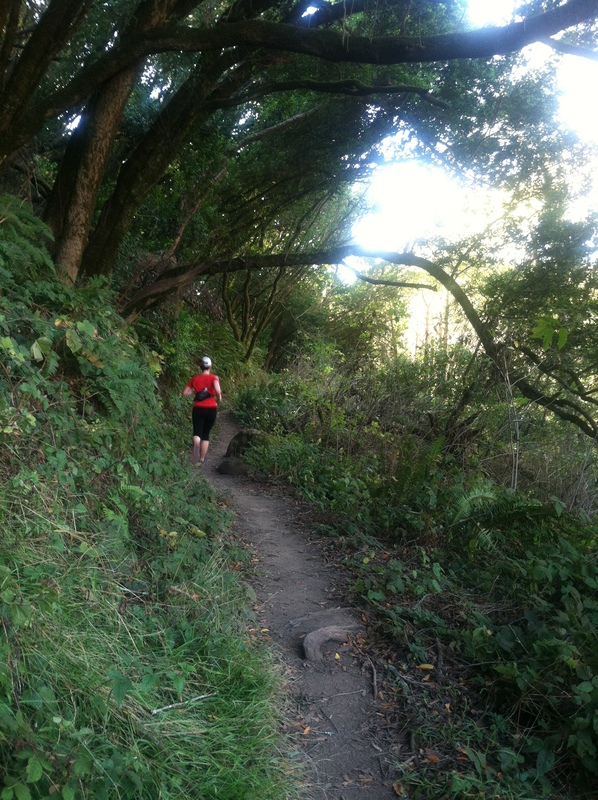 Once I made it out of the wooded area, I ran as fast as I could towards the Stinson Beach finish line. I was ready to be done with this journey. I crossed the finish line in 4:15. I ended up placing third in my age group, which is not only highly unusual but also ridiculous given the caliber of runners participating in this event. Now that my legs have healed, I’m ready for TNFEC. Wow! Congrats on 3rd place! I’ve never done a trail race before but it sounds like a big challenge! Great job! Congrats on placing! Nicely done. Great race recap! Way to finish strong despite losing a contact lens. Respect. Great job! I can’t believe you lost a contact mid-race and still finished 3rd. That’s awesome! Thanks Sandy! It was definitely a weird experience! How exciting to place 3rd! Congrats! I’ve hiked there before – beautiful place! Thank you! It is a gorgeous area to be outside. Congratulations! Looks like yet another really beautiful and cool race! I’ve never done a 30km, but would like to try one out. It was a fun distance to try. I’d recommend it! Congrats on a strong race! I can’t imagine a contact popping out while running let alone on trails! Third is awesome!! Awesome job! You are more than ready for north face! Thank you for the vote of confidence, Jessie! Congrats on 3rd. Sounds like a good warm up for your 50k. Thanks Jamie! It was definitely a weird experience!